The Divine Mother as She has been perceived in the movements of thought from the Ancient Near East to the Indigenous peoples of the Northern and Southern hemispheres are discussed. This book is both a study and a meditation experience on the interchangeability between the Divine Spirit and the Divine Feminine. 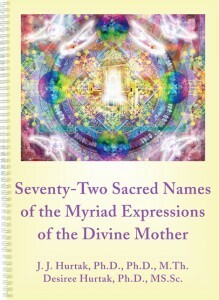 With 72 color illustrations by Mel Lyon, this is a living book that reveals the spectrum of work of the Divine Mother so we can reflect upon Her Greater Presence in our lives. Beginning with the Holy Spirit of Holism and reaching to Gaia, we can share in the experience of unifying the heavens and the Earth, both without and within. From the myriad Names of the Divine Mother in the Sanskrit tradition to the notions of the feminine Wisdom amongst the ancient Mayan cultures, the Divine Mother is there to welcome the occasion of our rebirth and regenesis. Indeed, our daily prayers can draw upon Her Names, while the cosmic pictures give voice to our hearts’ deepest desires— to be in service to the Source of All and all of humanity.